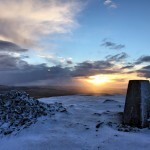 Having activated Pen Y Fan (GW/SW-001 – 886m ASL – 8 points) four times previously, I was looking for something new to do. My wife was taking part in a Mountain Midnight Marathon again, which runs up southern Britains highest mountain (and then back down), so I’d have a few hours up at the summit while cheering her on. She did the same run last year and I put the summit on the air using the 6m band, which from what I remember, was also a first for the summit. I’ve previously activated the summit using 2m (great VHF takeoff) and 40m too. This year I reviewed the SOTAWatch page for Pen Y Fan and while looking at the bands previously used by activators, there was only really one band that I could use for the first time… good ol’ top band (160m). Sure, if you have proper microwave kit (above 23cm) you could bag some new bands, but otherwise it’s all been done! SOTAWatch page for Pen Y Fan – not much left to do.. I know the summit pretty well, so descending in the dark wouldn’t be a problem, so I was happy to take equipment for a 80m and 160m SOTA activation. I was pretty confident that I’d have enough space for an 80m dipole, as long as I setup well away from the main summit cairn (often very busy), but would I manage to squeeze in a top band dipole? Cooking my evening meal on the way up – dodgy food, but the view is unbeatable! I came up over Corn Du and then walked on to the final ascent to Pen Y Fan. Two things surprised me; first of all how nice the weather was and secondly how many people were around. As previously mentioned I’ve been up here 4 times, but on none of those occasions have I ever seen the sun or felt any warmth, but I have suffered a battering wind, rain, thick mist and snow! The nice conditions had seemingly encouraged everyone in South Wales to take an evening walk up Pen Y Fan. The lack of wind was most welcome, this would have severely curtailed putting up a 10m mast and a linked dipole for 80m and 160m. But stillness in the air, at the height of summer, means midges and plenty of them. I hadn’t thought to pack any insect repellent, because I assumed there would be wind up there.. I mean this is a Welsh summit, there’s always wind! I chose to setup as far away from the summit cairn as I could, and found a spot devoid of the hordes. I setup the mast and staked out the linked dipole, at that point I realised why the summit hadn’t been activated on top band, the space needed is prohibitive! Eventually I worked out an orientation that wouldn’t get in anyone’s way. 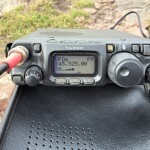 I promptly setup the Elecraft KX3 and put a spot out on 80m. Trade was swift with 20 contacts made in 45 minutes, I worked a mixture of SOTA chasers and Worked All Britain members. The WAB group knew I would be out as I had planned to join their net on 3.760, but alas continental stations were already coming in and the net wasn’t running. You can find my full log at the bottom of the page. After working 80m, I went to the linked dipole and clipped the top band elements to the 80m elements. The configuration was an inverted V and meant the end of the top band sections came very close to ground, maybe 5 inches off. Not optimal, but not much I could do without carrying another two supports, and no there’s no trees up here, they wouldn’t last very long! The good news was that the KX3 tuned the top band dipole easily using the internal ATU and I could put out a signal using 10w. I operated on 1.960 MHz, which also happens to be WAB frequency on top band, I had a few mobile phone issues getting a spot out, but I managed to work a few people while waiting for that to go through. I worked seven contacts on 160m, but guess what, signals were well down on 80m. 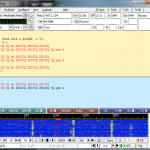 It was a struggle to hear some, usually where a non-resonant antenna was being pressed into use on top band! Additionally it was only dusk, so I assume the D Layer was still attenuating the signals on such a frequency on the border between short and medium wave. YL taking in some much needed liquids – which just so happened to be the last of my water! All of the contacts on top band were very welcome using QRP, and as already mentioned some were a struggle. A highlight was working Ian GI0AZB in Northern Ireland, this is a fair distance considering it wasn’t fully dark yet! Having seen my wife reach the halfway point, I knew I had limited time to operate before I’d have to meet her at the finish line down in Talybont on Usk. This involved packing up, a long descent and a 30 minute drive. Plus I’d long since run out of water, so it was best to pack up and make a move! I took the “motorway/tourist route” back down, this is my go to option after dark here, as it’s quite hard to go wrong! I managed all of the descent using the last glimmers of dusk and a bright moon! But I did need my head torch to trace my way back to the Storey Arms car park. Sadly the burger van had long since closed, so I was out of luck for a late evening snack. I thoroughly enjoyed this activation, it was a little different, a little unique and with great weather to boot! Many thanks to everyone who called in and for those who persevered on top band. 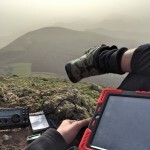 Pen Y Fan has now been put on the air using top band! Would I use top band again from up here? Probably not, it’s hard to put up an antenna that big and usually the WX wouldn’t allow for it! 2m FM activations are so much easier, plus the kit is a lot lighter! 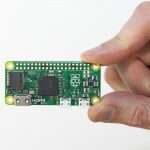 160 meters, portable, QRP, mountain top, tight time constraints, all while running short on water – and you pulled it off with a sizable number of contacts. Now THAT is operating. Thanks for the report. Thanks for the comment John and nice to get you in the log. I haven’t heard of what John G4YSS has done, but that certainly sounds much more convenient than a full 160m dipole! I’ll check it out!